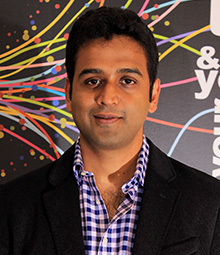 Nithin had been a stock trader for over a decade before founding Zerodha in 2010, India's first discount brokerage, widely credited as being a disruptive force in the Indian broking industry. Today, Zerodha serves 1+ lakh clients who generate trading turnovers of over $1.5 billion daily. With Zerodha, Nithin has worked relentlessly on solving the woes individual Indian investors face. On top of being extremely low cost, Zerodha is also the first Indian broker to offer investments completely free of charge and to introduce its investing platforms in several regional languages in rural India. In 2014, he won the CII “Entrepreneur of the year” award. Zerodha won the BSE/D&B “Emerging brokerage” award in 2014 and 2015 consecutively. More recently in its annual business review, the Economic Times featured Kamath as one of the 10 Indian businessmen to watch out for in 2016, who will be most influential in their respective industries. In addition, Nithin has been working on creating an ecosystem for spurring innovation in the financial technology industry in India. He has founded Rainmatter, an R&D fin-tech incubator and fund that has invested in several fin-tech startups and actively produces financial innovations for the mass market. More recently, he launched a “Broking as a service” platform, where an entire brokerage and its technology platforms are available on the cloud for developers and startups to build their own platforms, the first of its kind in the world. Outside of work, Nithin enjoys playing the guitar, poker, and basketball, and playing with his one year old toddler, Kiaan.